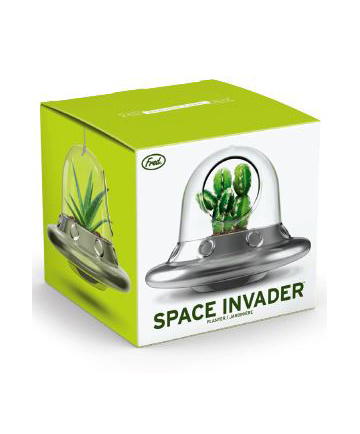 Space Invader Planter is invading your home and adding a cosmic boost to your mood! This lightweight-yet sturdy borosilicate glass vessel is the ideal place to put an air plant, mini-succulent, or an Unidentified Flowering Object! The silver-hulled ship is 4 1.2" high and 5 1.2" wide and has a 2" hole to insert your favorite plant or object. Space Invader comes with shiny silver hanging cord, and is packaged in a colorful display box.